Q1: I know how to password protect a PDF file using Preview, but how do you remove that p/w protection? 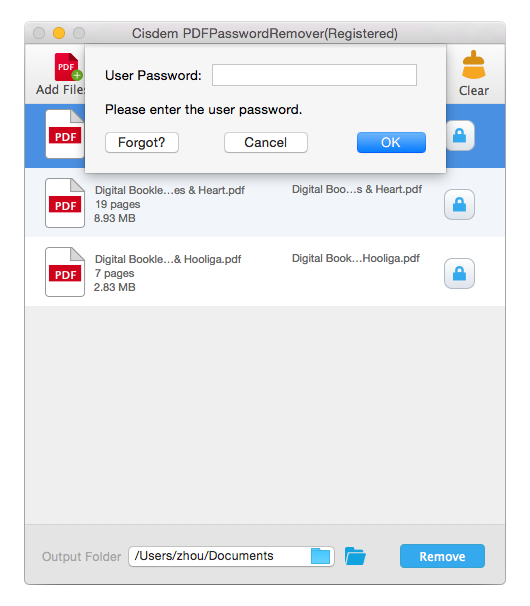 Q2: How can I remove a password protection from PDF file to enable me print and edit on Mac? Actually, many PDF users prefer to directly manipulate their PDF files, instead of repeatedly inputting the password to remove restrictions from secure PDF for further actions like editing, copying, printing. 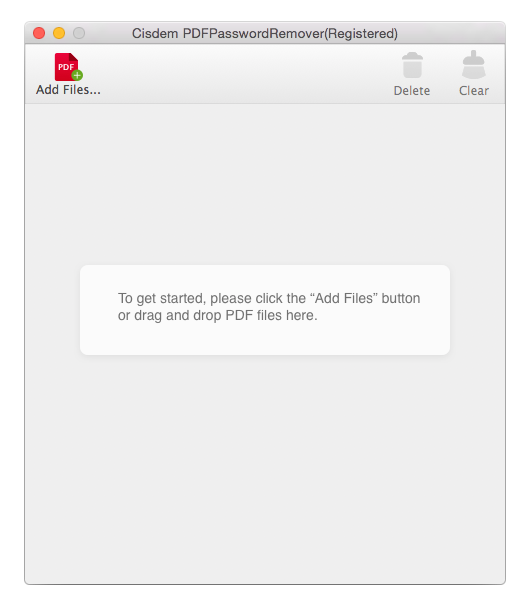 If you are a regular PDF user on Mac, I guess you are working on PDF with Adobe Acrobat and Preview. Here in this tutorial, I will show you 3 best PDF Password Remover for Mac , which are often overlooked as a good PDF Password Remover to unlock your PDFs on mac for free manipulation. There are numerous apps available to remove protected PDF password, the Cisdem PDF Password Remover is the one on the top of my list. It is not only designed to helps users directly remove the password and restrictions from PDF, but also enables users to unlock PDF on mac even when they forgot the user password to open it. No matter your file is added with an owner password or user password, Cisdem PDF password Remover, with its intuitive interface and versatile function, will be your professional assistant in this field. How to Remover PDF Password Protection on Mac with Cisdem PDF Password Remover? Step 1Download and Install the PDF Password Remover for Mac. It is stand-alone application with a high compatibility with Adobe readers, also it is small in size and won’t clutter your Mac. 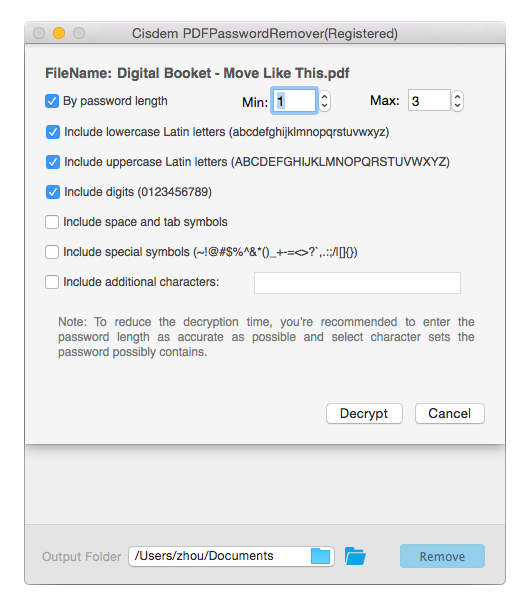 Step 2Import Password-Protected PDF Files to this PDF Password Remover for Mac. 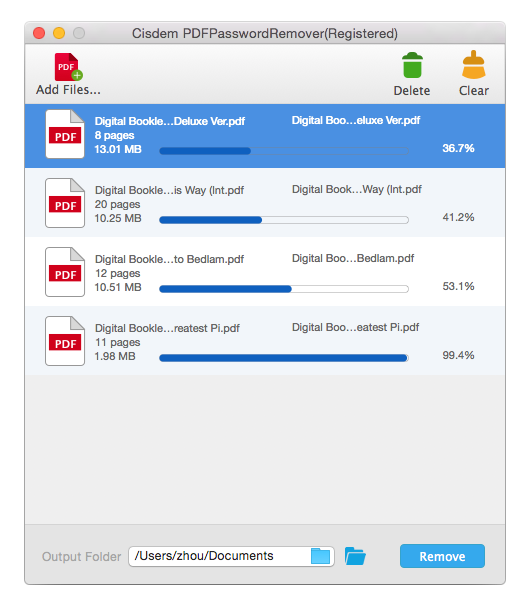 Drag&Drop PDF files or directly add files as it instructs into the main interface. It supports batch removing password from PDFs on mac. 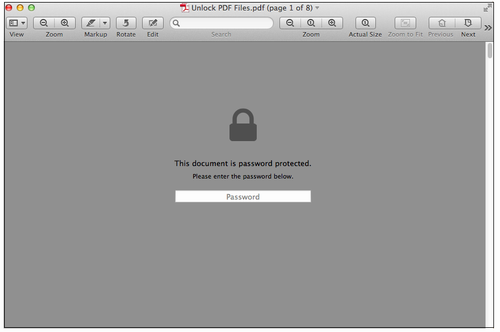 Step 3One Click to Remove Password Protection from PDF on Mac Instantly. Once you have added the encrypted PDF into Cisdem PDF Password Remover for Mac, click "Remove", you will get an equivalent PDF without and restrictions, and the secured pdf is unlocked. Go to the settings of Cisdem PDF Password Remover as follows. You can check or fill in the above options like, password length, additional characters, etc. By doing so, you will save a lot of decryption time. Once your user password is decrypted, you can continue to remove securities by following previous steps. If you are looking for more PDF Password Remover Mac, please go to part 4. Speaking of PDF, Adobe always comes first into our mind, for the reason that PDF was a proprietary format controlled by Adobe and later officially released as an open standard.So, Adobe Acrobat, as a matter of course, is a good PDF password remover for mac users to get protected files unlocked. 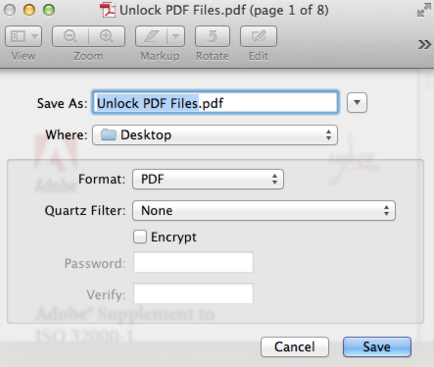 Let's see how to unlock PDF file on mac with password! You will be requested to enter the permission password to remove the PDF password protection from pdf on mac. 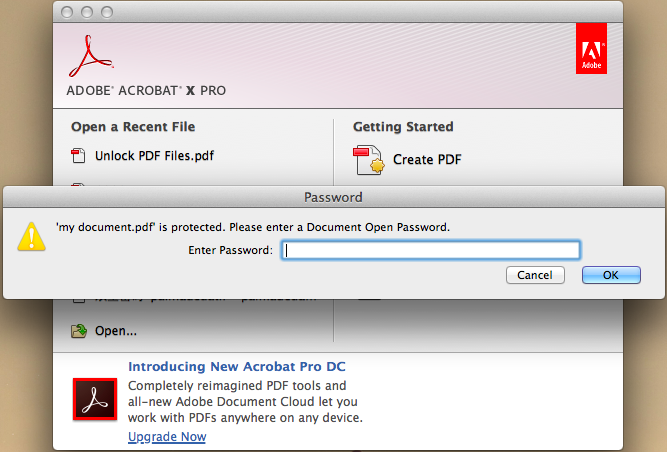 If you purchased the Acrobat Pro, you can even remove security from protected documents in batch! For your information, this method only works when you know the PDF password. IF YOU FORGOT OR LOST THE PDF PASSWORD, find a PDF Unlocker. When working on a Mac, Preview can be deemded as the best free PDF Password Remover for mac. With several clicks, you will get the PDF password protection removed instantly. Step 1. Open the password-protected PDF document with Preview, you will be asked to enter the password. Step 2. Go to “File” and choose “Save as”. 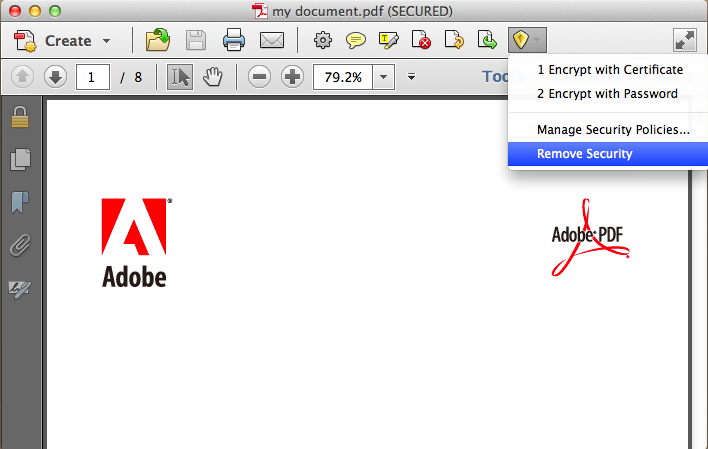 Step 3.Save the document in PDF format and leave the option “Encrypt” unchecked. The password of your PDF is removed! In our first solution to remove password protection from PDF on mac, we recommend our users to turn to the program Cisdem PDF Password Remover because it is really the one performs outstandingly in this field. Of course, there are 3 alternative PDF password removers for mac. iPubsoft PDF Password Remover for mac has served to remove pdf password protection since 2009, it is both available for Mac and Windows version. The program is designed to remove owner password directly without entering the password, also to remove user password only if you can enter the correct user password. But the greatest problem of iPubsoft PDF Password Remover for Mac lies in its discontinued upgrade, the latest release was on 08/13/2012, users who are using MacOS 10.10 or newer will have problems to use even launch the program. iStonsoft PDF Password Remover nearly shares everything in common with iPubsoft PDF Password Remover, in terms of UI, features and process. It also offers Mac and Windows versions and the latest Mac version only supports MacOS 10.12 or earlier. Still, it can remove owner password protection directly, but require the user password to remove the user password protection, without the corrent user password, you won’t be able to unlock the PDF. With a neat and stylish interface, Wondershare PDF Password Remover allows users to do the password removal in a quite easy way. It supports to remove owner password directly, but still requires entering the correct password to remove the protection from an user password. It is both available for Mac and Windows platform. Yet, same problem like other pdf password remover, the latest mac version is for MacOS 10.12 and earlier. So, as you can see, Cisdem PDF Password Remover for mac is probably the only one that can remove both owner and user password protection, even if you have forgotten the user password, also the one among few to work on the latest MacOS Mojave 10.14. That’s no wonder, Cisdem PDF Password is picked as the best PDF Password Remover for Mac by so many users. There may be more option to remove pdf password protection on a mac, but the most efficient way is always turning to an expert. And for this reason, I recommend you to invest in a third-party app like Cisdem PDF Password Remover for Mac to remove the PDF password. How to Print a Secured PDF Document with Ease? Fortunately, receiving and printings a password protected PDF, even not knowing what the password is not a tricky problem anymore. With a PDF Password Remover, you will be able to print a secured PDF document with ease. How to Crack PDF Password without Failure? Working with PDF has fitted into our daily routine, we often add password to protect the PDFs. However, many times, we just find a PDF with unknown or forgotten password and we have to crack it to resume our access to the file. This article will reveal readers the tips to crack PDF password on Mac and on Windows. Share 5 user-friendly and affordable tools to unlock password-protected PDF on Mac, enable users to open, edit, print…as they needed to boost their productivity. Also, by comparing these programs, users can find the right one to fit their needs. I feel 3rd party ones are better, they are fast to run, good at bringing satisfying results. Come here to say thank you. I manged to remove the password from downloaded web PDF with your tool, it is really great and saved me. Thanks again. You mean the app can find back forgotten pw? Oh, that's really cool cuz I got a bad memory here. Thanks for sharing, I tried and it worked, really useful.